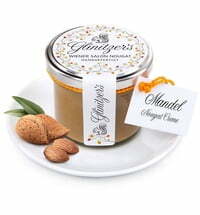 The fine nougat cream is made of fresh hazelnuts, high-quality ingredients and a lot of love. Eat by the spoon or add to desserts, pancakes, ice cream or dumplings. For the perfect start to the day, spread the velvety hazelnut nougat on a fresh roll! Start your day on a happy foot.